Strategic partnership with Robert Friedland’s HPX. 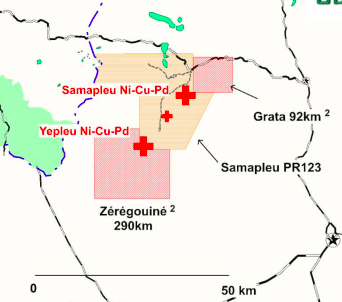 World-class exploration potential @ Samapleu Ni-Cu Project. Share position in SRG Graphite covers over half of market cap. Sama Resources (OTC:LNZCF) has been a partnership holding for just over a year and is now one of our largest positions. We initiated the position through a private placement conducted at C$0.10, which included a full, 5-year warrant at C$0.15 (with no accelerator). We’ve since bought on the open market – bringing our average cost per share to roughly C$0.11. While the performance of Sama shares has been exceptional over this period, the company remains relatively unknown and shares continue to offer significant upside. Subtracting the company’s cash and position in SRG Graphite, Sama has a fully diluted enterprise value of just under C$40m – despite the involvement of Robert Friedland, the grand slam potential of the company’s Samapleu Ni-Cu Project, and the battery-grade nickel narrative that will soon become mainstream. In this Featured Investment piece, I begin by providing an overview of the company – with a particular emphasis on the management team, the company’s outsized working capital position, and the recently announced strategic partnerships with CVMR and Robert Friedland’s HPX. We then review Sama’s flagship asset: the massive Samapleu nickel-copper-cobalt-PGM project located in Côte d’Ivoire, West-Africa. Next, we discuss how SME shares offer tremendous upside to further discovery at the Samapleu project, and limited downside due to the company’s outsized position in SRG Graphite. We conclude with Sama’s expected catalysts over the coming months, so readers can keep tabs on the company’s progress alongside me. 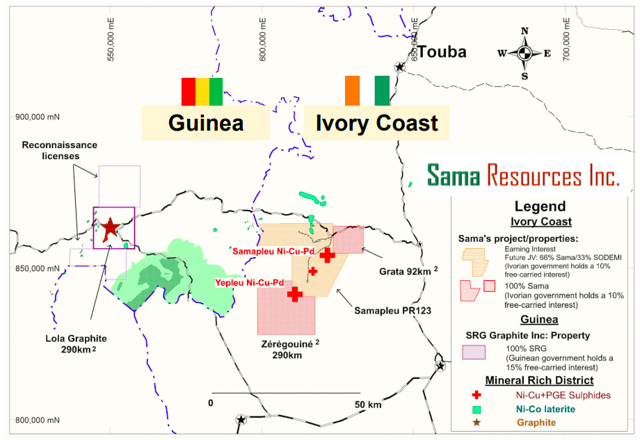 Sama Resources has been exploring and developing the Samapleu Project in Cote d’Ivoire, West Africa since 2009. I was originally attracted to this story due to the quality of the people involved. Executive Chairman Benoit La Salle has three decades of experience in West Africa and founded SEMAFO, now a multi-billion dollar gold producer, in the early 1990’s. He has been involved with the Sama story since 2012. CEO Dr. Marc-Antoine Audet, who has led Sama since 2010, is also the right man in the right place. He’s a geologist by trade who has 27 years of experience exploring for nickel with Falconbridge and Xstrata Nickel. Much of this time was spent in West Africa. Between Benoit, Marc, and the rest of the management team, insider ownership sits at an acceptable 8%. China Minmetals, a Beijing-based metals trading company, owns 12.9% purchased through its subsidiary MMR Exploration in 2011. The Australia-based investment vehicle African Lion owns 3.6% of Sama and has been involved since at least 2010. Rick Rule’s Sprott Global also owns 1.5% of the company. The agreement stipulates that Sama will pay C$5m in cash or shares to CVMR (due within 90 days of the granting of the mining lease) in order to license CVMR’s proprietary nickel and iron powder production technology. CVMR will also receive a royalty equal to 15% of the sale price of metal powders produced by the Plants in excess of the London Metal Exchange price. This partnership should be a win-win for both parties. From Sama’s perspective, nickel powders sell at a significant premium to LME nickel prices “providing the company with a market advantage and growth opportunity not previously available.” CVMR meanwhile has the opportunity to scale its production of nickel and iron powders to satisfy the growing appetite of its customer base, while also participating in the economic upside of the Samapleu Project through the 15% royalty. This partnership with HPX is significant for a handful of reasons. First, it ensures that there will be no equity dilution for Sama shareholders for at least 2 years – as HPX is responsible for the next C$30m of expenditures at the project. In addition, Sama can now leverage HPX’s highly skilled exploration team and the proprietary technology that they’ve developed. This includes HPX’s “Typhoon” IP and EM geophysical survey technology, which has 4-5x deeper penetration than the surveys previously conducted at Samapleu. Finally, Friedland’s involvement validates the scale of the opportunity. Friedland isn’t interested in anything less than a world-class deposit, indicating that he thinks the best has yet to be found by Sama. It was also worth noting that Voisey’s Bay, the marquee discovery of Friedland’s career, shares close geological similarities to Samapleu. Upon closing of the HPX deal, Sama will have 243 million shares, warrants, and options outstanding. This results in a fully diluted market cap of C$97m at the current share price. However, the company has a substantial working capital position with C$9m in cash and roughly C$50m in shares of SRG Graphite – dropping the fully diluted enterprise value to just under C$40m. The Samapleu Project is located in western Cote d’Ivoire, along the country’s border with Guinea. The land package is massive, spanning 828 square kilometers. As seen in the map below, the project consists of three different permit blocks: Grata, Samapleu, and Zeregouine. Both Grata and Zeregouine are 100%-owned by Sama (subject to a 10% free-carried interest to the Ivorian Government). The Samapleu permit is a joint venture owned 66% by Sama and 33% by SODEMI, the Ivorian state mining company (also subject to a 10% free-carried interest to the Ivorian Government). Remember that HPX now has the right to earn 60% of Sama’s ownership in these three permits by spending C$30m and delivering a feasibility study. The project has already seen ~24,000 meters of drilling and close to C$30m put into the ground. The vast majority of the work conducted thus far has been at the “Samapleu Main” and “Samapleu Extension” deposits found within the Samapleu claim block. 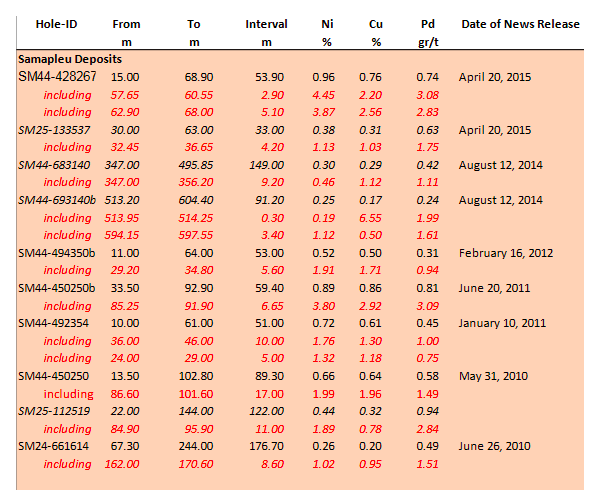 The below chart displays selected drill results from these two deposits. Drill assay SM44-428267 is the best we’ve seen at the project so far – cutting 53.9 meters grading 0.96% nickel, 0.75% copper, and 0.74 g/t palladium. This includes an 8 meter intercept of massive sulphide grading 4.08% nickel, 2.43% copper, and 2.92 g/t palladium (starting 60m from surface). In September 2013, the company released an initial NI 43-101 resource for Samapleu Main + Extension. The company reported an indicated resource of 14.1 million tonnes grading 0.24% nickel and 0.20% copper, and an inferred resource of 26.5 million tonnes grading 0.24% nickel and 0.18% copper. The company has added significantly to the Samapleu Main + Extension resource in the years since. Just recently, Sama completed a 2800m infill program with assays expected in the coming weeks. Additionally, the company is working on a Feasibility Study expected in 2018. This will assess the economics of a smallish, open-pit operation at Samapleu Main + Extension. I’m expecting an initial capex of below US$150m. The study can be expected to incorporate CVMR’s proprietary technology into the flowsheet. Concurrently, the company is working hard with the Ivorian government on completing permitting. This process is aided significantly by Benoit La Salle’s deep connections within the country. The company is expecting to see approval of its Environmental Impact Study by the end of Q1 2018, followed by a Mining License by the end of 2018. The upcoming Feasibility Study provides SME investors with a near term catalyst, but it is important to understand that this story is much bigger than whatever the headline numbers turn out to be. There are a couple reasons for this. First, Sama has over two dozen targets across the project that either haven’t been tested sufficiently or tested at all – due to budget constraints and/or a lack of accessibility. A few of these key targets include: (1) Yepleu which saw promising drill results in early 2014 that were never followed up, (2) Bounta where a 2% nickel sulphide lens outcrops at surface, and (3) Grata which recently lit up a downhole EM survey. The funding provided by HPX will allow for all of these targets to be properly assessed in a comprehensive exploration program. Additionally, both Sama management and HPX’s exploration team think that the near-surface mineralization discovered thus far by Sama originated from high-grade nickel sulphide reservoirs located deep below the earth’s surface. Thanks to HPX’s “Typhoon” technology, the team for the first time will be able to assess the likelihood of these high-grade feeder zones down to 2000 meters in depth. Discovery of one of these sulphide reservoirs has the potential to make Samapleu a multi-billion dollar asset. And that’s exactly what Friedland is after. Once the Typhoon Survey is completed in the upcoming months, Sama management expects to see 2-3 drills active on the property. By the end of 2018, investors can expect to see drill results from Samapleu Main + Extension, Yepleu, Bounta, Grata, and potentially a few more top priority targets. SRG Graphite was spun out from Sama Resources in January 2017. In the 12 months since, SRG’s share price has rocketed by over 300% and the company’s market capitalization has surpassed Sama’s. Sama owns 40% of SRG, which at current share prices is worth roughly C$50m. Well before SRG Graphite was spun out, Sama Resources acquired what is now the Lola Graphite Project. As seen in the below map, the project is less than 50 kilometers away from Samapleu but is located across the border with Guinea. The company also staked additional reconnaissance licenses around Lola prospective for graphite and nickel laterites. After some promising drill results and metallurgical tests in 2014-2016, management decided to spin Lola and the rest of the Guinea licenses into a separate vehicle. This move made sense at the time as Lola differed from Samapleu both in target metal and jurisdiction. But what has happened since has exceeded management’s expectations by an order of magnitude. Lola has quickly turned into a world-class graphite development project. The deposit itself checks all the boxes. It’s massive with 3.22km2 of surface graphite mineralization and a length of 8.7km, making it one of the largest graphite projects in the world. The flake distribution is excellent with 89% of the flakes either large, jumbo, or super-jumbo in size. The mineralization starts at surface and is weathered down to 20 meters on average, which bodes well for the project’s operating cost. Infrastructure is a valid concern but, given Lola’s status as the hottest development project in Guinea, should be manageable. This very well could become a mine. SRG in essence has the same management team as Sama – with Dr. Marc-Antoine Audet serving as CEO and Benoit La Salle serving as Chairman. The company is moving quickly and has enough working capital to get to a production decision. There will be significant news flow in the meantime with a Prefeasibility Study expected in the coming weeks, 1-2 offtake announcements anticipated by midyear, and a Feasibility Study expected by end of year. SRG is targeting first production in H1 2020. The initial production target is 25k tonnes per year, which shouldn’t cost more than C$75m to build. Given the company’s current market capitalization of C$120m, a mine of this size is already feasible on a 100% equity basis. However, the company’s close relationship with CORIS (an African bank that owns 17% of SRG) indicates that a debt component is likely. If Marc, Benoit, and the rest of the SRG team are able to hit these milestones, they are in a position to make SRG shareholders (and by extension Sama shareholders) very happy. As mentioned earlier, Sama will have a fully diluted market capitalization of C$97m upon closing of the HPX strategic partnership. The company’s cash position will be C$9m once they receive the C$5.25m in private placement proceeds from HPX. And as we know, Sama owns roughly C$50m in shares of SRG Graphite. This results in a fully-diluted enterprise value of just under C$40m. Sama is still a very early stage company. Despite the Samapleu Main + Extension Feasibility Study due out shortly, investors should think of this through the same lens as Friedland – as a world-class nickel exploration story. As such, it is difficult to put a fair value on SME shares given the high risk/high reward nature of exploration. There are however a couple ways to put the company’s current valuation into perspective. The first is to consider the value of the historical work already conducted at Samapleu, and then to compare this to the company’s enterprise value. Considering that Sama has put C$30m into the ground already, the historical expenditures cover 75% of Sama’s current enterprise value. What does this indicate? Keeping in mind that using historical expenditures as a valuation yardstick is far from an exact science, in my experience assets that are valued at or below historical expenditures are generally a bargain. By this standard, Sama wouldn’t qualify as a “bargain.” However, it is fair to say that SME shares have very little speculative premium baked into the current valuation. This is despite the burgeoning nickel/EV narrative, the immense size of the potential outcome at Sama, and most importantly Robert Friedland’s recent validation of the story. Here the best-case scenario is that Sama and HPX discover a Voisey’s Bay 2.0 in the coming 12-24 months. Voisey’s Bay ended up being a C$4.3b outcome but we’ll assume a C$2b best case at Samapleu to avoid sounding entirely unrealistic. What are the chances that Marc, Benoit, and Robert find what they are looking for? Even considering HPX’s Typhoon technology and previous success with nickel sulphide discoveries, we’ll put the odds of a best case outcome at 15%. Multiplying the best-case outcome of C$2b by this 15% chance of success gives us an expected value of C$300m. Out of conservatism, we’ll assume that SODEMI gets a piece of a pie and go with the 74% discount. This results in an expected value of C$78m, which is roughly double the current fully-diluted enterprise value. Considering the company’s working capital position of roughly C$60m and fully-diluted share count of 243m, this suggests a share price of roughly C$0.60 (or US$0.47) is fair at this time. A final key point is that, unlike the vast majority of junior miners, further equity dilution will not be an issue here. Sama management has assured me that the company has no need to come back to market to raise money until 2022 at the earliest. Remember that HPX is now responsible for the next C$30m in expenditures in Samapleu, while Sama has ample cash and SRG shares as working capital. Shareholders should expect G+A expenditures of no more than C$1.2m per annum over the coming 3-4 years. In conclusion, I’ve provided below the catalysts that can be expected at Samapleu over the coming months and years. I’ve also included SRG Graphite’s upcoming milestones at the Lola Project, given the relevance to Sama shareholders. While the Samapleu Main + Extension Feasibility Study will be interesting, the most important of these catalysts by far are the first drill results AFTER the Typhoon Survey has been completed and assessed. Assays can be expected in Q3 and Q4 of this year. Additionally, the number of drill rigs that we see on the property post-Typhoon Survey will give us an indication of HPX’s excitement level. It would be a red flag if we don’t see at least two rigs. While Sama’s share price has seen substantial gains over the previous four months, the company is still inexpensive when you consider the value of its stake in SRG Graphite and the significance of the recently announced HPX agreement. Prospective investors are advised to get involved ASAP, and then re-assess the investment once post-Typhoon drill results are reported later this year. Disclosure: I am/we are long LNZCF.